Volvo Manhattan enhanced its flagship NYC showroom with a large, non-standard 5x7 video wall, and turned to the ClearOne VIEW Pro video distribution solution to power it. IHSE has expanded the connectivity of its KVM solutions to include location-independent access over an IP interface. At NAB 2019, VITEC will demonstrate its “zero-latency” MGW Ace Encoder and MGW Ace Decoder solution, which the company says achieves video contribution with no visible delay. Matrox Video has launched the Matrox M264 S4, a new addition to the M264 family of H.264 hardware codec cards. Tactical Fiber debuted two new fiber-based transmission systems for cameras equipped with built-in NDI or NDI Converters. Key Digital has introduced the KD-DA2x4G and KD-DA2x8G high-performance 18Gbps HDMI distribution amplifiers providing two HDMI inputs to four or eight respective HDBaseT outputs. MultiDyne Fiber Optic Solutions will introduce its new BULLET series of miniature, rugged, fiber-optic link products at the 2019 NAB Show. Arista Corporation has introduced the Emerald Series HDBaseT 2.0 Family of transmitter/receiver products. 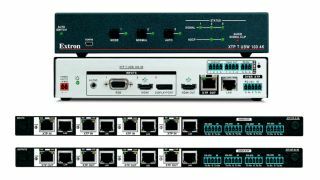 Key Digital has introduced the KD-X222PO HDBaseT extender set with slim chassis design. The IPR-10G2-HDMI and IPR-10G2-SDI Mini-Converters are compact, quiet video and audio receivers capable of bridging 10-bit HD IP video signals to HDMI and SDI. Childs will manage relationships with regional partners that sell and install Atlona solutions. A unified KVM solution, ideally with tightly integrated video wall software and a platform for overall system management, provides a flexible foundation for optimizing control room operations.